LeBron James Game Winning Shot Save the Cavaliers in OT! 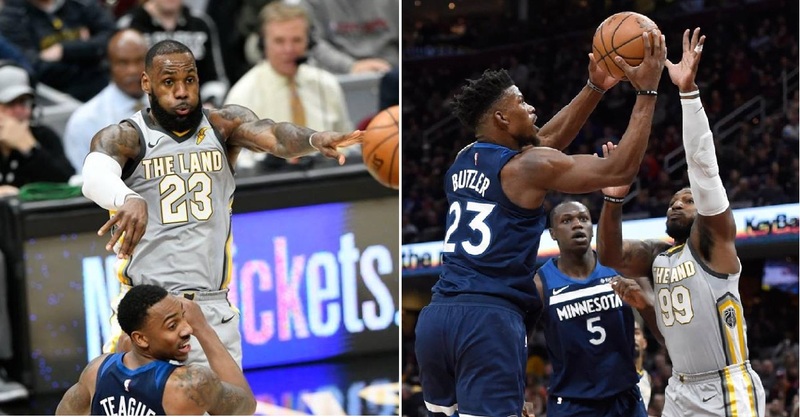 NBA – The Cleveland Cavaliers are back in the winning column after they beat the visiting Minnesota Timberwolves in a down to wire finish at the Quickens Loans Arena in Cleveland, Ohio. The Cavaliers ends their 2 – game losing skid to remain the 3rd best record in the Eastern Conference despite the drama and struggles of the team. Aside from the win the Cavaliers get their revenge over the visiting team in a humiliating 2nd most worsts lost in franchise history in their 1st meeting at Target Center in Minnesota. Cavalier’s superstar LeBron James came out with his A-game tonight, dropping his 9th triple double of the season with 37 points, 10 rebounds and 15 assists and made the game winning shot in OT to save the Cavaliers in another disappointing loss. James made two clutch plays that save the Cavaliers with only 24 seconds to go in OT, James blocks Jimmy Butler shot in Wolves possession and hits a fade away game winning shot with only 1 second remaining in the next possession to win the game over a great defense by Butler. Cavs fans inside the arena along with the Cavaliers players celebrated the win as they temporarily forgotten the crisis over the land and enjoyed a great game against an elite team in the West the Minnesota Timberwolves. In the next game, the Cavaliers will face the Atlanta Hawks before facing the East best record, the Boston Celtics, where Isaiah Thomas is suited to play against his former team in another important game for the Cavaliers to regain some momentum and become an elite team again in the East? No Comment to " LeBron James Game Winning Shot Save the Cavaliers in OT! "